Henllys Lodge is a detached house, set in its own grounds, with garden surrounding. The house is not overlooked and there are views of hills from the garden. It is situated approximately two miles from Llandovery, a small market town with all amenities (shops, restaurants, cafes, bank, Post Office etc). Henllys Lodge was completely renovated in 2008 when a curvaceous extension was added. Sustainable building materials were used including sheep’s wool insulation, wood wool board, glass and lime render, lime mortar and locally coppiced oak. The wood floors have underfloor heating via ground source heat pumps and solar hot water panels. All the rooms are tastefully decorated and comfortable. There are a number of paintings and prints by local artists depicting local sites and landscapes, nature photos and other decorative items. There is wifi and a landline telephone (mobile reception is limited). There are four bedrooms: three double rooms, two of which have ensuite wetrooms, and a room with a built-in bunk bed with full-sized single mattresses. There is in addition a separate bathroom with bath and shower. All bathrooms have heated towel rails. The beds have allergy-friendly mattresses and bedding. There are wireless speakers in the bedrooms. The ground floor is open plan. From the front door there is a matted lobby entrance. The large kitchen/dining room has modern energy efficient A or A* raged appliances including a Rangemaster cooker with two ovens, Miele fridge-freezer, Miele dishwasher, plus washing machine, tumble dryer, microwave and a full supply of cooking equipment and utensils, crockery and cutlery. The living room has a double sided wood burning stove, which is cosy in the winter months. We supply sustainable sourced local logs. The 40” LED television has freeview channels available, including radio. There is a DVD player with a selection of DVD’s, a CD player with i-pod dock/extension cable, table football, a large selection of games and puzzles, maps and books including guides, leaflets and books about the area. We have folders with information for walkers and cyclists. The kitchen/diner opens out onto a Welsh slate patio area with garden tables and chairs. A barbecue is available for use. Flower beds are planted with native plants and shrubs which flower at different times of the year and a lawn leading down to a pond, teeming with wildlife including fish, frogs, newts, water lilies, etc. There is a double swing for our younger guests. Fill up the bird feeder to watch all sorts of birds, including nuthatches, finches, and woodpeckers. Red kites and buzzards can be seen soaring overhead. There is private off-road parking for 3 cars and a locked shed to accommodate bikes. We encourage recycling and composting. Eco-friendly cleaning products are used throughout. Towels and bedding provided. 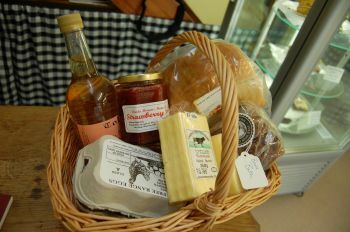 A Welcome Basket from Iechyd Da in Llandovery (see below – some items will be changed according to supply) will be provided for guests.